Connecticut is one of the fastest growing solar states for its size, and the industry promises to continue growing for the active state. 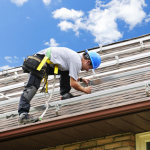 There are over 147 solar companies operating in Connecticut to date, which means that for a professional installer there is plenty of growth opportunity. To find out more about the specifics of solar companies and solar installations in Connecticut, please visit the Solar Energy Industry Association’s website, www.seia.org/state-solar-policy.